Going out into the wilderness in pursuit of hogs, whitetail, or elk? 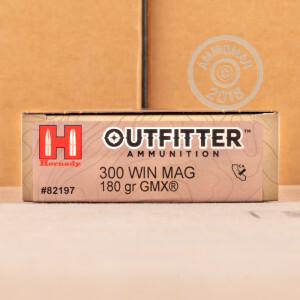 Then you ought to prepare for the worst elements that Mother Nature can muster with this 300 Win Mag cartridge from Hornady’s Outfitter line of ammunition! It features a waterproofed case mouth and primer, so a heavy downpour won’t result in an empty chest freezer, and its reloadable brass casing is plated with nickel to assure that it too will resist corrosion. 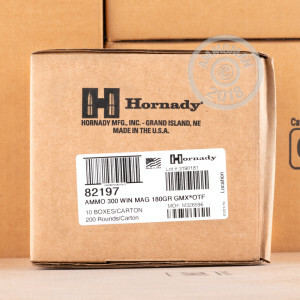 This premium round features Hornady’s 180 Grain GMX projectile. The GMX is made entirely of copper alloy, so firing it in California won’t land you in hot water. 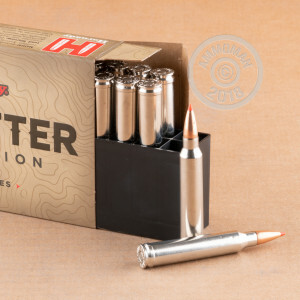 The bullet’s monolithic construction further means that it fouls very little, and also that it can routinely retain 95 percent or more of its weight during penetration to create a deep wound channel. This bullet is highly accurate thanks to its pressure relieving grooves and its polymer tip, the latter of which initiates expansion up to 1.5 times its original diameter upon impact.